Almost 50 Years of Experience in Septic System Installations Service & Repair! Pumping the septic tank regularly is the main thing that can and should be done to extend the life of your septic system. It is recommended to pump your septic tank every 3-5 years. The Main Sewer Line, connects the home's plumbing to the septic tank. The Septic Tank, which is typically buried a few feet under ground and approximately 5-15ft. away from the home. The job of the septic tank is to collect all the material (liquid and solids) that is discarded out of the homes sewer line. Solids will settle at the bottom of the tank and turn into sludge, while oils and grease will form scum at the top of the tank. The wastewater then exits the tank through the distribution pipe to begin the soil absorption process. The Distribution Box, is where wastewater from the septic tank flows by gravity. On newer systems, the distribution box allows the owner to control which part of the fields are being used at any given time. A diverter valve within the the distribution box directs the flow one way or the other, allowing one side of the field to "rest " or " dry" while the other side of the field is doing all the work. It is important to switch the valve on a periodical basis. 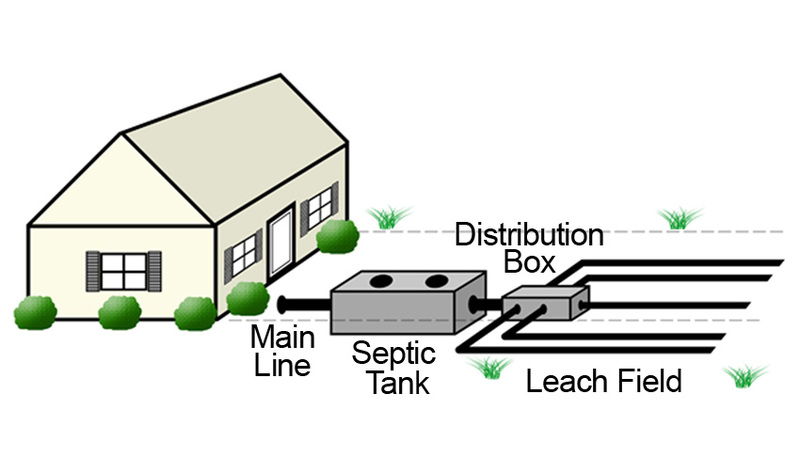 By doing this, the distribution box evenly distributes the wastewater from the septic tank into the leach field. The Leach Field is made up of a network of perforated pipe extendign out away for the septic tank which is buried in gravel filled trenches. This is the soil absorption process. Wastewater that flows into the leach field is eventually absorbed into the ground. Click for a larger image and then Contact Mastin Septic System Service Now to answer your septic system questions! What kinds of things should NOT be flushed into a septic tank? These items do not break down in a septic system or septic tank and can clog the drain field perforated piping. Ground Food-Garbage disposals are a popular item in most households but they are not a healthy item to have for your septic system. Ground up foods add to the amount of solids in your septic tank and increase your need for periodical pumpings. Powdered Detergents-Excessive amounts of powdered detergent can cause clogging in your septic system. Avoid using more than the normal amounts of powdered detergent or switch to liquid detergent. 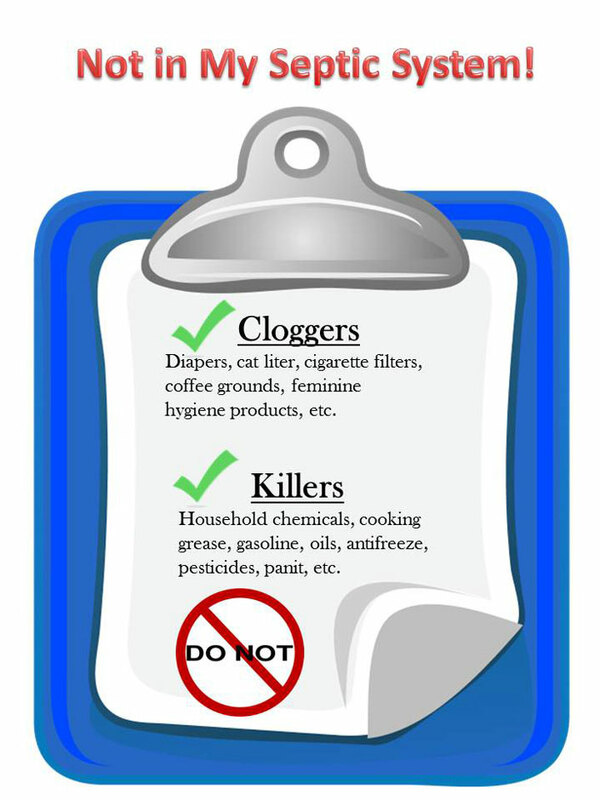 Tampons & Sanitary Napkins-These items are NOT bio degradable and should not be flushed into your septic system. For almost 50 years, Randy Mastin Septic Tank, Inc. has been providing septic system and water well services in Toledo and Northwest Ohio. Co-Man Portable Toilets has what it takes to accomodate the restroom needs of any size job, party or special event. Luxury Restroom Trailers for Executive Events, Weddings or any Event! Portable Toilets for Construction sites, Large Events, Parties, Receptions and more.